“I’m so interested in the question, ‘What can we be proud of?’” Krakauer says during an interview in his office at the institute where, on this June afternoon, smoke from fires burning in the national forest semi-obscures the vast city and mountain views from Hyde Park Road. Stacks of books crowd most available surfaces—George Johnson’s Fire in the Mind and The Book of Trees by Manuel Lima catch the eye; a model rocket sits atop Krakauer’s desk. Questions such as these, which require considering humanity and life on Earth from an interplanetary perspective, drive SFI’s new InterPlanetary Project. It launches July 18 with a panel discussion between scientists, writers, artists and thinkers whose work all revolves in various ways around humanity’s future—in space and otherwise. InterPlanetary builds on the type of complex, interwoven, boundary-pushing research SFI is known for locally and internationally. Santa Fe Institute’s main partner in the endeavor, Creative Santa Fe, sees InterPlanetary as another joint project aimed at thinking through problems with both local and global significance. The project also comes at a time during which interest and money for space science is harkening a new golden age for galactic exploration. 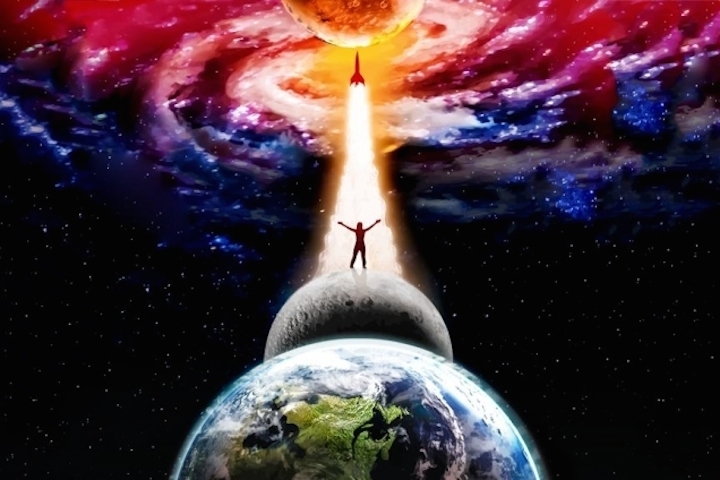 Among other developments, NASA ushered in a new class of astronauts from a record number of applicants, scientist Stephen Hawking proclaimed humans only have 100 years left on Earth, and SpaceX technologist Elon Musk published detailed plans for resettlement on Mars. That mind-bender encompasses many concerns—from preparing humans for space travel to the hard science and technology required to make the journey, along with aspirational initiatives centered on how we might communicate with other life in the universe (should it exist). Last but not least: How can humanity tackle the problems of today to prepare for its future? Writer Kate Greene spent four months as a crew member on the first HI-SEAS simulation of astronaut life on Mars. As an adult, Greene ended up on a 2013 NASA-sponsored simulated trip to the Red Planet by luck. She was scrolling through Twitter and spotted a link to an NPR article on why astronauts crave Tabasco sauce. NASA was set to begin studies on astronauts’ food habits and, at the end of the article, there was a call to apply to be one of six crew members on the HI-SEAS project—the Hawaii Space Exploration Analog and Simulation, a Mars simulation research project that takes place on Hawaii’s Big Island, approximately 8,200 feet above sea level on the Mauna Loa side of the saddle area. Greene applied and was accepted into the program—not by luck. Her background includes work as both a laser physicist and a science journalist. She spent her four months on the project as a crew member and crew writer, contributing dispatches for Discover magazine, while also conducting a separate sleep study for NASA. HI-SEAS is a Martian simulation on the slopes of the Mauna Loa volcano on the island of Hawaii. Day to day, she says, the experience didn’t necessarily “feel like living on Mars, and I don’t know if living on Mars day to day would feel like living on Mars.” A fair amount of her time and, presumably, a fair amount of time for future astronauts who would actually live on Mars, was spent indoors in a habitat that included living, kitchen, work and exercise space. The project incorporates 20-minute communication delays with the outside world and no real-time conversations to further simulate an off-world experience. There were times, when the crew would don their spacesuits and walk around in a landscape that is red and rocky and “looked a lot like Mars on the outside,” during which Greene could imagine she was exploring another planet. The experience also yielded other rewards, such as contributing research to help future astronauts, and collaboration with new people. Moreover, Greene, who will appear on the SFI panel, says the experience changed her work as a writer, and set her on a new path of integrating her science-writing background with more personal narratives. Her book of essays that came from the experience, Once Upon a Time I Lived on Mars and Other Stories, is forthcoming from St. Martin’s Press. Director of Arizona State University’s School of Earth and Space Exploration, Elkins-Tanton’s own research focuses on the processes involved with the formation of terrestrial planets. She has received numerous awards and accolades as both a scientist and a teacher. In January, NASA announced Elkins-Tanton’s Psyche Mission had been chosen as one of the government space office’s Discovery Program projects. Psyche is a metallic asteroid researchers believe is the core of what would have been a planet in the earliest days of the solar system, and which may provide information about the Earth’s own core. The project spacecraft is scheduled to leave Earth in 2022, reach Psyche in 2026 and spend close to two years mapping and studying the asteroid, which orbits the Sun between Mars and Jupiter. “Psyche is probably the only way human kind will visit or measure a core directly,” Elkins-Tanton says. Elkins-Tanton, like Krakauer, staunchly believes that inspiring work—scientifically or otherwise—comes through collaborations across disciplines. Her own school at ASU is somewhat unusual in science academia in that its faculty, students and research projects work across a spectrum of interests: from cosmology to earth science to technology. Last year, ASU’s president asked Elkins-Tanton to lead an initiative across all the schools for an interplanetary initiative that has, she says, synergy with SFI’s project. Arizona State University’s Psyche Mission, scheduled to launch in 2023, will spend 20 months studying the metallic asteroid. artist and Inman Gallery, Houston. Regardless, the prospect that we are not alone in the universe is fertile ground for scientists, artists and artist-scientists such as Dario Robleto. Robleto has spent much of his career thinking on the message people of earth might want to convey about themselves. A formative moment happened when he was 6 or 7 years old and first encountered the Golden Record, placed on the spaceships Voyager 1 and 2 in 1977 containing images, sounds and messages meant to capture life on earth. He’s referring to Ann Druyan’s brain waves, recorded shortly after she and Carl Sagan, with whom she collaborated on the Golden Record, admitted they were falling in love. Robleto says in many ways his work has been directed by Druyan’s actions. “She essentially snuck love on board,” he says. Two years ago, Robleto—who has ended up working with Druyan—became the artistic consultant for the “Breakthrough Message” project, one of Yuri and Julia Milner’s Breakthrough Initiatives founded in 2015 “to explore the Universe, seek scientific evidence of life beyond Earth, and encourage public debate from a planetary perspective,” according to the project’s website. “Breakthrough Message” is a $1 million competition to design a message that comprehensibly captures humanity and life on Earth for another civilization. Robleto also serves as artist in residence at the SETI Institute. The work at SETI—the Search for Extraterrestrial Intelligence—includes a vast array of research and development projects in the service of finding signs from advanced civilizations in the galaxy. The Santa Fe Institute’s InterPlanetary Project will help unfold the mysteries of the universe. Based in Houston, Robleto has shown work in both solo and group shows across the country, and has been recognized with a variety of awards, fellowships and residencies. As an artist, Robleto’s practice spans mediums: He works in sculpture, paper, print and more. As an artist with both a background and passion for science (he was a biology major before switching to the arts), he prefers the term “trans-disciplinary” because it fully encompasses the degree to which his projects are intertwined rather than merely referential to scientific issues and phenomena. The question of scale connects with another driving concern Robleto brings to his work and that has been a research focus at SFI: altruism. “Competition and destruction,” Robleto says, “dominates so much of all our topics.” His personal quest “is poetic and scientific proof we can be cooperative at some fundamental level,” which makes as much evolutionary sense as the belief that competition drives human existence. Return to Krakauer’s original thought experiment: What has humanity done for which it can be proud? Krakauer believes that while specific citations would vary from person to person, most would likely name artistic or scientific achievements rather than, say, “human decency,” although he believes the latter also would be legitimate. The question ties into Krakauer’s own background as a mathematic biologist, and one of the many thoughts that prompted the InterPlanetary Project as a whole. We are living in a time in history, he argues, filled with “incredibly positive things,” among them the ability to connect with other people all over the world, progress in our understanding of the environment, “the second great space race” and many other accomplishments. These signs of progress are occurring alongside other signs of the worst time in history, what Krakauer characterizes as a “stupidity pandemic, and the deepest political distrust and the worst kinds of prejudice.” Interdisciplinary work, such as the InterPlanetary Project, provides an opportunity to consider how and why such darkness and light can occur together—and perhaps yield some solutions. Re-contextualizing some of these challenges within enlivened discussions is a way of “injecting playfulness … and hedonism” into serious topics. Changing the lens through which we view our civilization and its workings might be one way (if an overly simplistic one) of considering panelist, former SFI president and distinguished professor Geoffrey West’s work. For much of his career, West, a theoretical physicist, focused on fundamental questions of physics: the cosmological implications of the evolution of the universe, the nature of dark matter. For the last 15 years, his research associated with the Santa Fe Institute has been looking, from a physicist’s perspective, which he describes as “quantitative, analytic, computable and therefore predictable,” at “the phenomena that go on on this planet. In particular, the questions to do with the generic principles giving rise to life and laws of life, the regularity that underlies the extraordinary complexity of life around us, social life, the socioeconomic life, the life we’ve created on this planet.” (West’s most recent book, released in May, is titled Scale: The Universal Laws of Growth, Innovation, Sustainability, and the Pace of Life in Organisms, Cities, Economies, and Companies).